The Boundary Commission‘s final proposals for the new boundaries for parliamentary constituencies have finally been laid before Parliament, as part of its review of seats. Irrespective of whether I agreed with the decision to cut the number of seats, I do think the number of electors in each seat should be more equal – although I’m not sure it should be as arbitrarily applied as it has been in the process as we have seen – but my experience of the consultation process, and much of the outcome leads me to question the whole thing. The proposals for the seat I live in (North East Hampshire) had been a bit of a joke, so I engaged with the consultation, offering some solutions to the issues involved. For anyone who is interested, the town of Alton had been added to our constituency (even though it doesn’t sit anywhere near the other towns in the existing seat and is in another district/borough), but more importantly, Church Crookham (which sits in between my town of Yateley, and that of Alton) is split off from its ‘sister’ settlement of Fleet (they are basically inter-twined), and plonked in the separate constituency of Aldershot. 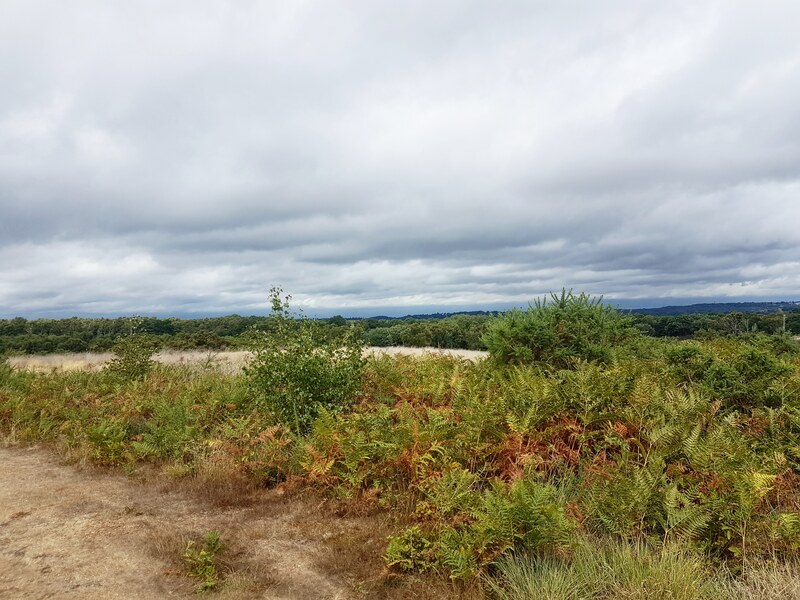 Looking out towards the Blackwater Valley from Yateley Common at Minley. I know it is a difficult issue, balancing the numbers involved, and like the Commission, I found it impossible to resolve just by taking off a single ward here, and adding a ward there – but I did hit upon a solution, re-drawing the parliamentary constituencies across the county boundaries of Surrey and Hampshire, using the natural communities of the Blackwater Valley as their inspiration. If you live in this patch, you know this is the reality when it comes to health provision, transport, education, employment, media and shopping for example. Imagine my surprise when after the its consultation, the Boundary Commission concluded that it had not received any alternative counter proposals!!! So, when it had a final consultation, I spent HOURS – nay, DAYS – doing the necessary work, constructing the new potential parliamentary constituencies using this approach, to demonstrate it IS possible to have an alternative proposal. Imagine my despair, when yet again, the Boundary Commission conclude in their report, published today (10th September) that respondents “did not provide any alternative counter proposals” when I blatantly DID. I made sure that I referred to their oversight in my submission to their final proposal, and so they could not say counter proposals had not been received, I put the detailed work in, working ward-by-ward, dealing with knock-on consequences in neighbouring constituencies. I was expecting them to reject my proposals, of course. What I wasn’t expecting them to do was completely ignore them for a second time. It has totally undermined any residual faith I had in the system of public consultation in this country. This was a genuine, and detailed attempt to engage with a public policy problem – and the process doesn’t even bother to acknowledge it. For your perusal, I thought I would provide my proposals. 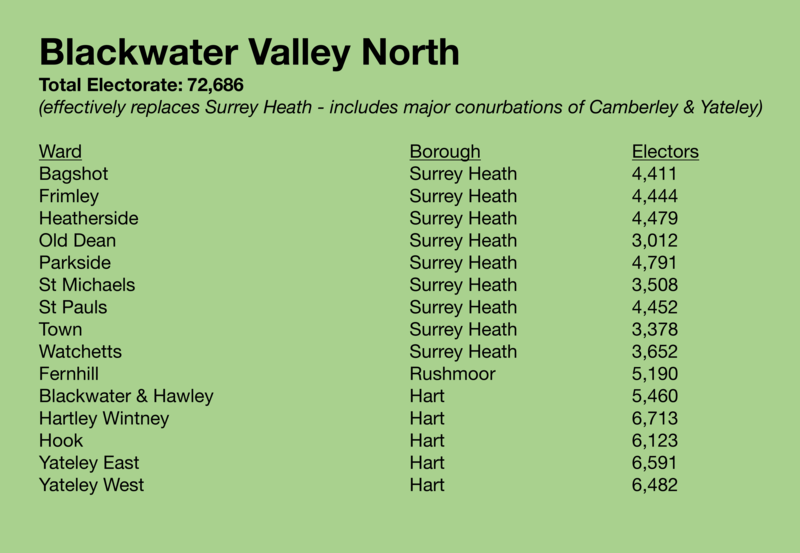 Blackwater Valley North means that the towns of Yateley (Hart, Hampshire) and Camberley (Surrey Heath, Surrey) are paired, which historically, makes much more sense. The towns have strong public transport, shopping and employment links, and the surrounding towns of Blackwater, Hawley, Frimley and Bagshot make natural bed-fellows. 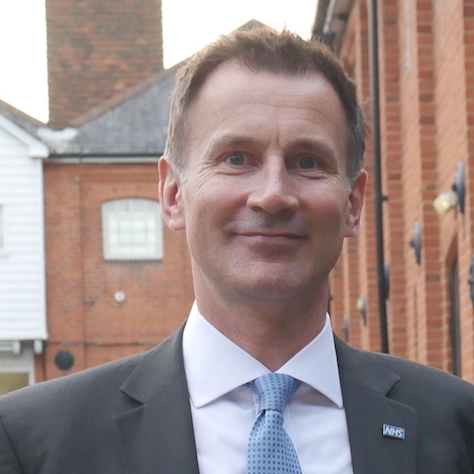 Frimley Park Hospital is a huge employer across more of this area arguably, than it is in the previous ‘Surrey Heath’ constituency, for example. It also deals with the anamoly of having Yateley, and a far flung town like Alton in the same seat. It makes much more sense for Yateley and Camberley to be in the same seat, than Yateley and Fleet – despite being in the same district, there are zero public transport links, and very little shared shopping or employment. Blackwater Valley Central seat re-unites Fleet with Church Crookham in Hart, Hampshire (separated by the current boundary proposals), and puts them with conurbation of Farnborough (Rushmoor, Hampshire), which makes for a more natural fit, as part of an overall set of seats based around the wider ‘Blackwater Valley’ conurbation; which has been used in public policy making circles, following the course of the River Blackwater – and more recently, the Blackwater Valley Route (the A331). 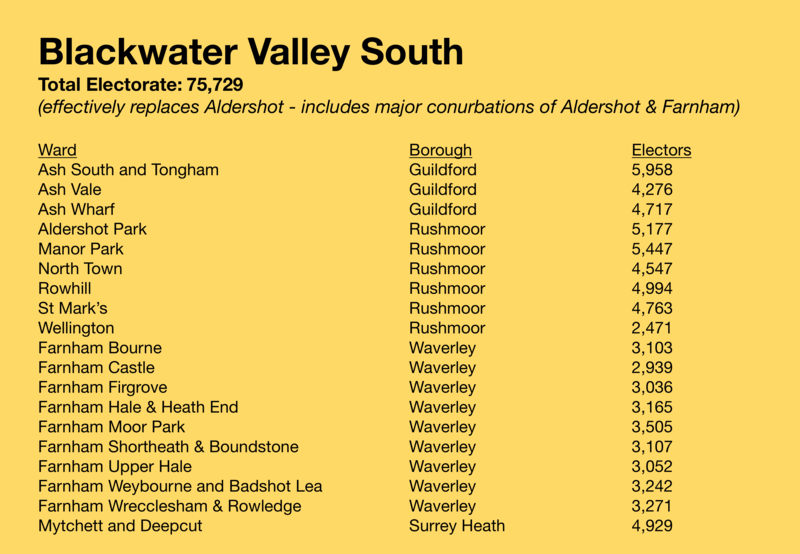 Blackwater Valley South brings together the towns of Aldershot (Rushmoor, Hampshire) and Farnham (Waverley, Surrey), which arguably is the closest fit in all of these proposals. It is bizarre in the extreme that the villages and towns of Weybourne, Badshot Lea, Ash and Tongham have all previously been in different constituencies. A solution based on the Blackwater Valley would help solve this, and bring two great towns together into one seat. East Hampshire in my updated proposals now includes all of the Alton seats, and Holybourne & Froyle, which in the Boundary Commissions proposals, had been switched to North East Hampshire. This makes no sense at all, since they are part of the district of East Hampshire, and look more naturally towards Petersfield for representation – and are not a natural community with places like Yateley. Guildford in my proposals has merely been tidied up to reflect the need to meet the constituency size rules. This includes switching Pirbright and Normandy from the previous Woking seat (this makes total sense since they are in Guildford borough) together with Bisley (in Surrey Heath) and Brookwood (in Woking), which together form a natural set of shared communities, and could fit well in the Guildford constituency. I have also included Mayford & Sutton Green ward (in Woking), and this fits well too in the northern fringes of Guildford. 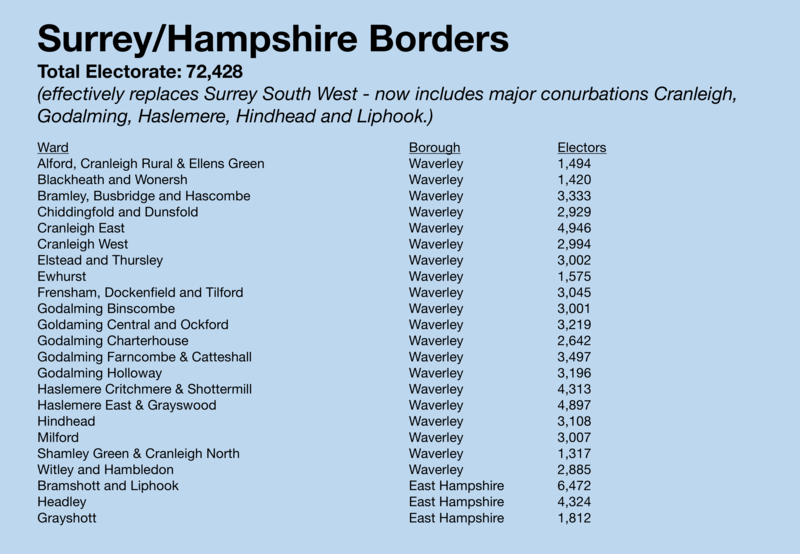 Surrey/Hampshire Borders is effectively the South West Surrey seat of old, but I have taken out Farnham. In its place, I have included a number of wards which had previously been in the south of the Guildford constituency (centred on Cranleigh), but which are all actually in Waverley borough, so arguably make a better fit for this constituency. As well as this, I have added three wards from East Hampshire. It needed to do this for the size, but in fact, Bramshott & Liphook, Headley and Grayshott, arguably fit more naturally with the conurbations of Haslemere and Hinhead than they do with Bordon and Alton. 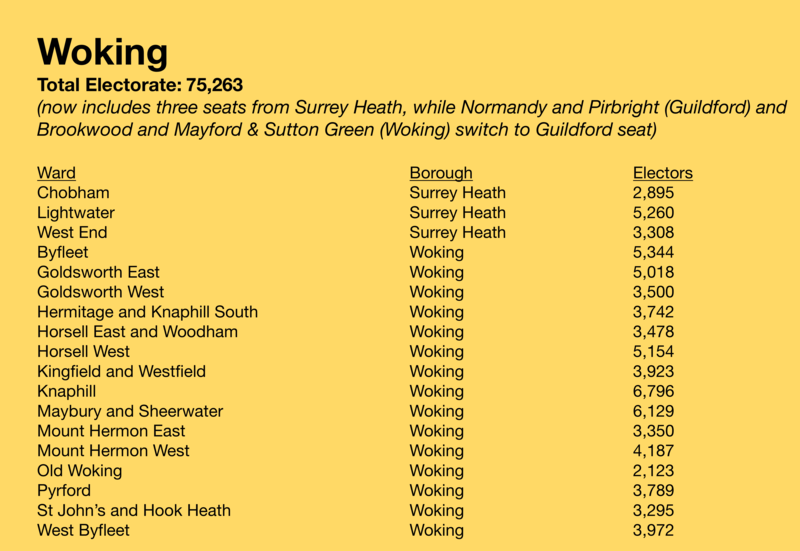 Woking is merely the same seat as before, updated to reflect my other changes. It now includes three wards from Surrey Heath (Chobham, Lightwater and West End) all of which fit more naturally with Woking than they do, say, Camberley. 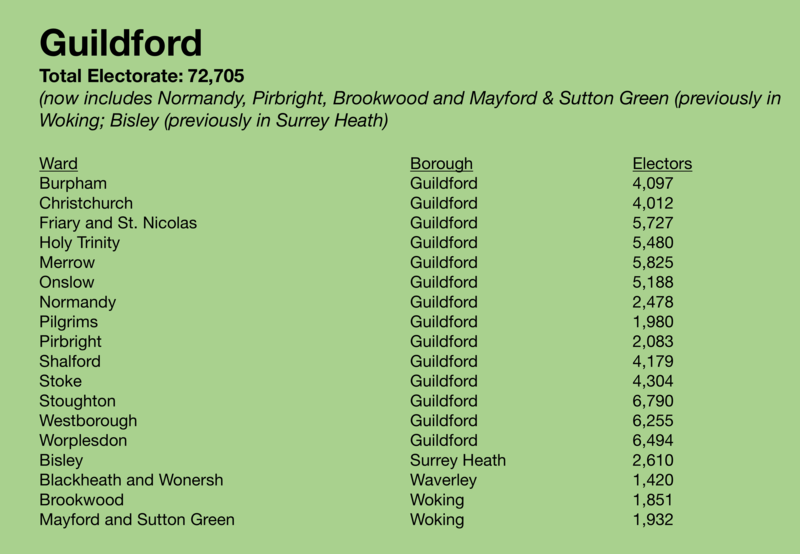 Two wards have been taken out to Guildford (Normandy and Pirbirhgt) which are actually in Guildford borough anyway, and one ward is taken out (Mayford & Sutton Green) to help meet the numbers, but arguably is as much on the fringes of northern Guildford as it is southern Woking. So, there you have it. I just wanted to show that when the Boundary Commission published their proposals today, and they said that there was an “absence of any such satisfactory overall counter proposal” for my area, they were wrong. I’m not pretending I had all the answers – I am sure there are holes here – but I genuinely felt I had the beginning of an answer to some of the issues, yet no reference was made to this at all in two rounds of consultation. I was born and raised in this area, and feel I have a good understanding of the Commission’s challenge – but feel totally ignored. I know they received the material, because it all sits, receipt acknowledged on their website. It’s just no reference is made to it in its supposedly detailed reports. 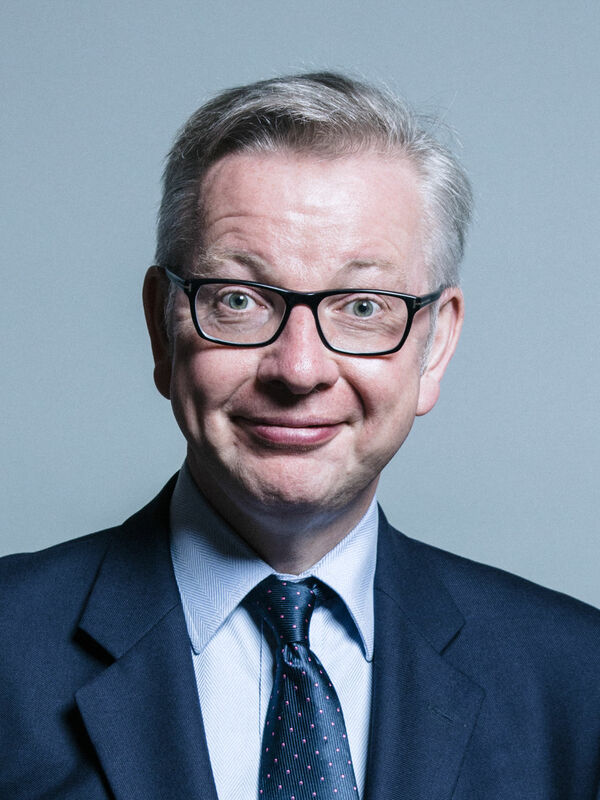 If I was feeling a little more cynical, I might feel it had something to do with the fact that my solution would effectively remove the seats of cabinet ministers Michael Gove, and Jeremy Hunt. And we couldn’t possibly have that, could we? The whole process waiting for the final Boundary Commission proposals has been a real let-down, and an anti-climax. For me, the process has not worked. It has not produced a solution which works, even though one could exist. 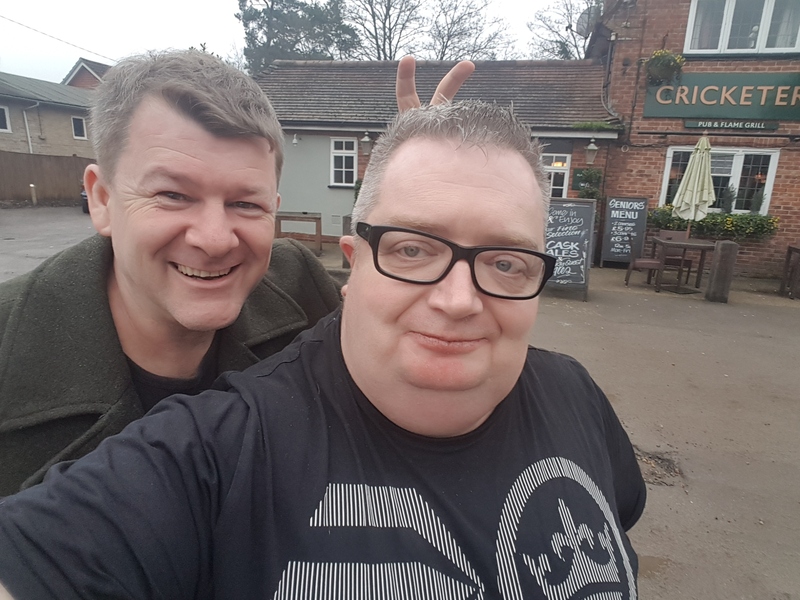 In the new seat of North East Hampshire, I can’t get to the neighbouring town of Fleet just four miles away on public transport – and including Alton over twenty miles away is just absurd, even though Church Crookham, just over four miles in the same direction is not included. I can genuinely understand why the eyes of thousands of people ‘roll’ when a public body announces it is putting a policy or proposal out to consultation – and I’m not sure I will be as keen to engage in future. When a public body says no counter proposal has been suggested during a consultation process, when as you can see from what I have outlined, I did propose one, a boundary has been crossed (just as in the cross-county ‘Blackwater Valley’ based solution I offered in North East Hampshire). I’m left feeling a little bit more dis-engaged. 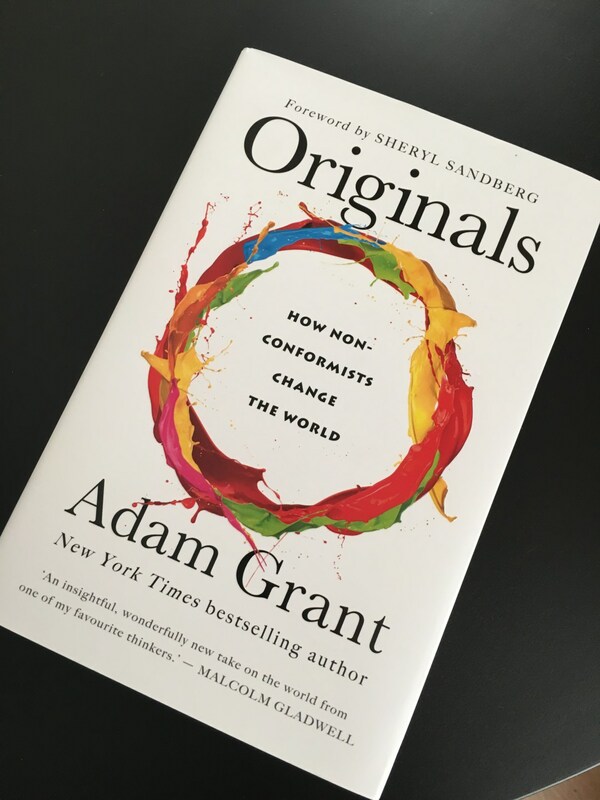 One of the questions I was most often asked as a lecturer was, “Can you recommend a good book about creativity?” I usually struggled, and more often than not, felt that the idea was a contradiction anyway. Then, last year, I heard a feature on a mid-morning show on BBC Radio 4 about this book during 2017, and it stopped me in my tracks. “The Runaway Species” clearly and elegantly creates a way of explaining how creativity flourishes, and how we can apply to our own lives, as individuals and organisations (such as schools, and companies) to foster creativity and innovation. Breaking: the whole is taken apart, or smashed to pieces, to re-fashion it, or to find something new. Blending: two or more sources are merged, to create something new. Although I have had to retire due to Chiari, I still take part in my CIPR CPD, and as the deadline loomed large recently, it was clear that this book had to come ‘off’ the pile of books I had recently bought which are waiting to be read, because it had much to pass on. I wasn’t disappointed. One of the great things about the book is that it uses many practical example from the worlds of art and science to demonstrate its formula, rather than leaving than leaving it as an abstract, impenetrable theory – and there are lots of pictures for a weighty book such as this! My only disappointment is that I no longer have a course/curriculum into which to integrate this book as a lecturer. I am genuinely impressed, and would have had a lot of excitement with students applying it. It may have something to do with the book being written by Brandt (a composer) and Eagleman (a neuroscientist), with them both drawing on their respective passions for inspiration. Forget the ‘eureka’ moments – we are talking more about ‘evolving sessions’. This books demonstrates how our brains have been working, more like ‘jackdaws’, constantly fashioning a new nest, from the things they have collected. It explains why human behaviour has these needs (such as the tension between predictability and surprise), and what we do to express them best – and how that can be harnessed to best effect. And it looks at the issue of why some ideas take off – and others stay firmly in the sand-pit. Bending; Breaking and Blending give us a kind of cognitive software – an on-going way in which our brains are approaching the world, and coming up with new ideas, answers to problems, and creative flourish. The more opportunity we give ourselves to do engage in this behaviour, the better. 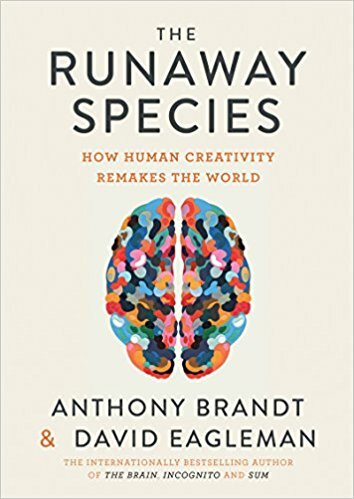 Thoroughly recommend – much food for reflection: Brand, A. and Eagleman, D. (2017) “The Runaway Species: How Human Creativity Remakes The World”, Edinburgh: Canongate Books. 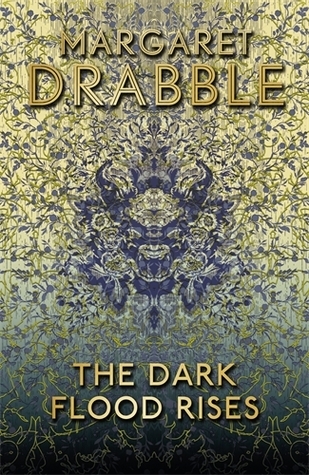 It’s not often I’m compelled to buy a book directly from what the blurb has to to say for itself on the sleeve, but with this book by Margaret Drabble, I was sold when I originally bought the book back in 2017. It spoke to me, and despite it being fiction, it seemed to speak to the stage of life I find myself in, and the mood I found myself in while I was looking to spend money in the bookshop at the time last year. “Fran may be old but she’s not going without a fight. So she dyes her hair, enjoys every glass of red wine, drives around the country for her job with a housing charity and lives in an insalubrious tower block that her loved ones disapprove of. And as each of them – her pampered ex Claude, old friend Jo, flamboyant son Christopher and earnest daughter Poppet – seeks happiness in their own way, what will the last reckoning be? Will they be waving or drowning when the end comes? Morbid I know, but it seemed to have many resonating themes for me with my, what can often feel stalling, middle age life. As I approach the age of 48 years old, I recently had to retire early due to a neurological condition which can play many wonderful tricks on my body and mind. 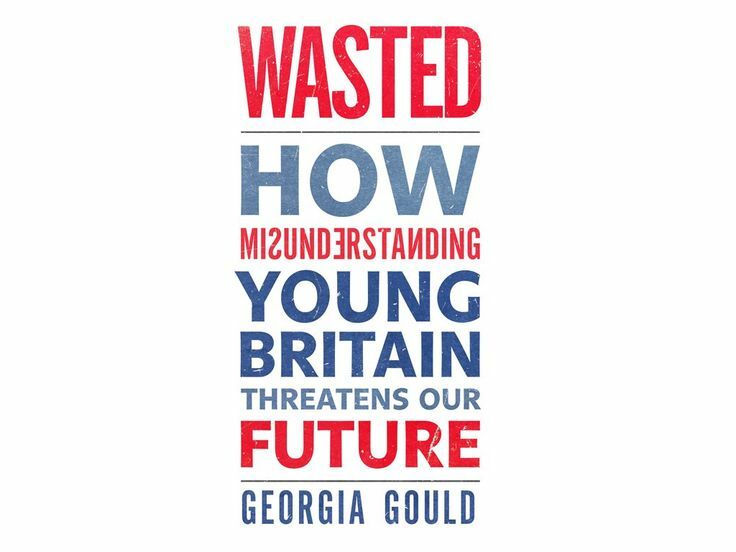 Not only that, two years ago, I downsized from my fast-paced life in London, to return to the house I grew up in in a much slower part of Hampshire, and seem to hang out with many more people aged over 70 than I do with people of my own age, so many of the issues the book says it was going to address are live for me, and the people I see regularly. That’s what I thought it was – the highs, lows and frustrations of growing old, and the challenges of modern life. There was some of that, but in fact, it was much darker than that. Bigger themes lying beneath the surface of what adds up to a ‘good life’ and how to see it out at the end – something facing us all as we apparently live longer, but better lives? And not just us, but our families and friends too. A lot of dying. Because of my own situation, it did give much pause for reflection at times, and made me think a lot about people I know, places I pass on the bus, or charities I have considered partnering with on projects in the past. In the work I have been doing on community podcasting at Sound Vault, for example, we have been thinking about doing projects on the role music can play in making memories, and have seen the difference simple conversations about music can have in people’s lives. At times, I found the book a little too incredible – too many coincidental character links for example – only for a coincidental link to ‘pop-out’ at the very same moment I was reading about it, to match with a detail in my own life, so perhaps I was too quick to judge. Too many of the characters in the book seemed to know each other by some twist of fate, but maybe that happens in particular professional sectors, even if they are separated by hundreds of miles at a particular stage in their life. The book is powerful in that it creates a dark ‘oil’ which feels like it envelopes the reader. It doesn’t judge, or prescribe. It is not depressive (I finally got round to reading it during January 2018, when I am at my most optimistic, most proactive, most organised), but can help us all reflect a little more clearly, yet thoughtfully about the door marked ‘Exit’. I don’t like to alarm anyone, but it’s approaching. For many of my nearest and dearest, and others in my networks, it has already come. And the public policy issues associated with it are growing. 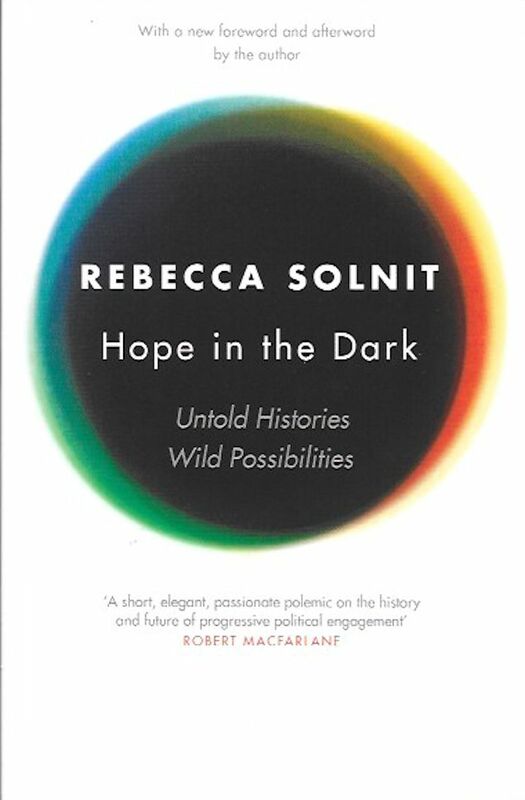 Solnit’s book was originally published in 2005, but has been updated to reflect what seems like ever increasing reasons for social and political gloom – particularly for those on the left – which is what drew me to the book. I consider myself a thwarted optimist, rather than an out-and-out pessimist, and was attracted to a book that promised to help define, and find grounds for ‘hope’ for those looking for progressive change on a range of social, political and environmental causes, when the forces lined up against such change seem overwhelming. For President Bush, and the Iraq War when the book was published in 2005, read Brexit, the prospect of Donald Trump, and the disarray in the state of the UK opposition parties in 2016. Rebecca Solnit writes compellingly. She asserts, “Hope doesn’t mean denying these realities. It means facing them and addressing them by remembering what else the twenty first century has brought, including the movements, heroes and shifts in consciousness that address these things now.” She is big on identifying, remembering, and celebrating past campaigns, and successes – which are many and varied. So, that told me! And it certainly answered a lot of the painful doubts I’d been having – and I know many of my friends have been having of late, on the topic of having hope. 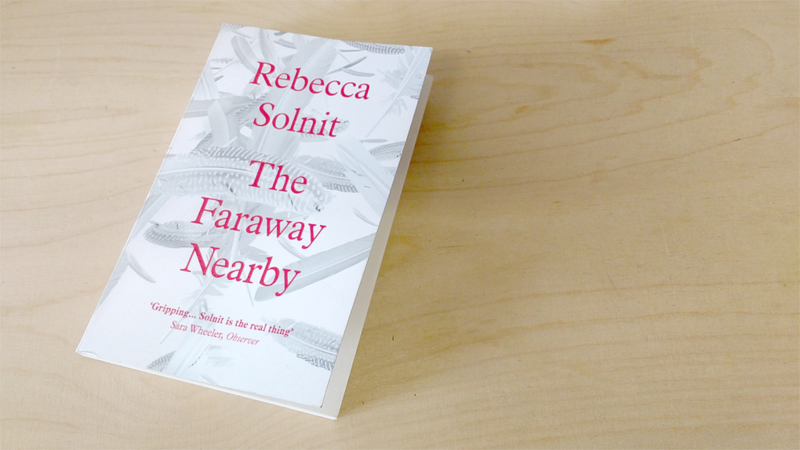 By exploring past successes, particularly of the last fifty or so years, Rebecca Solnit gives us good reason to have hope – and plenty of source material from which to learn lessons as to how to build it. The book is a reference guide for a number of liberation struggles throughout the world which have made for success. As Solnit says, “Memory of joy and liberation can become a navigational tool, an identity, a gift”. 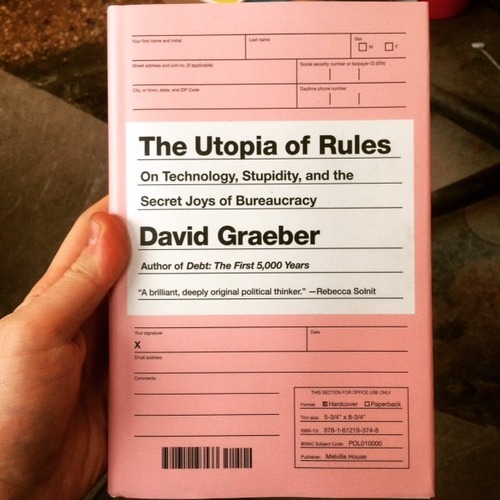 One final lesson worth noting from what is a fabulously uplifting book – and one that is incredibly pertinent for those on the left of politics who, like me, have concerns about whether the vehicles we are operating in quite get the magnitude of the problems we face. Rebecca Solnit provides us with grounds for hope! Easy to read, and practical in approach, its strategies for encouraging adoption of new ideas have uses far beyond innovation in its narrowest sense. I thoroughly recommend this book. The video above gives a snapshot of Grant’s book from the man himself. 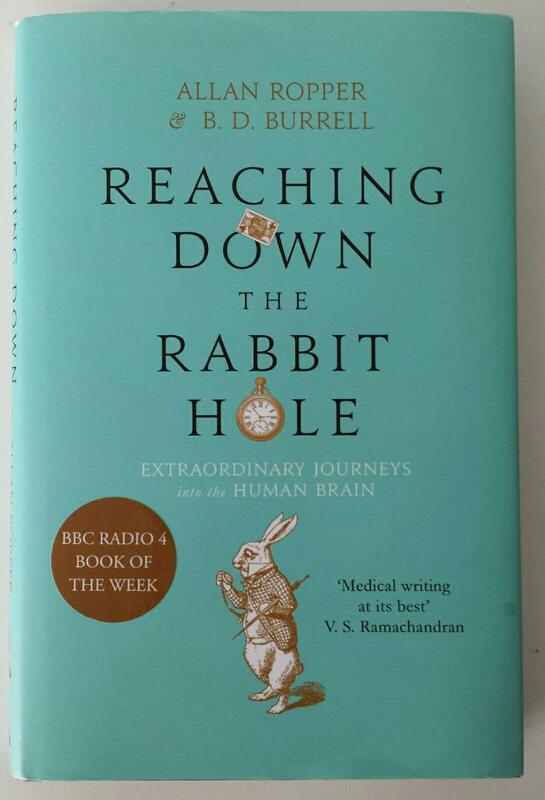 Having been under the care of a neurologist since 1997, I was fascinated by a book written by a US neurologist of the old-school, outlining his approaching to patient care and crucially, diagnosis. At the same time, it is as much an account of a qualitative to professionalism, rejecting a numbers-based approach, to one that is based on human interactions, and looking out for the ‘particular’. The account makes neuroscience sound more like an art, than it does a science, and goes some way to show why a young medical student might choose it as a specialism. 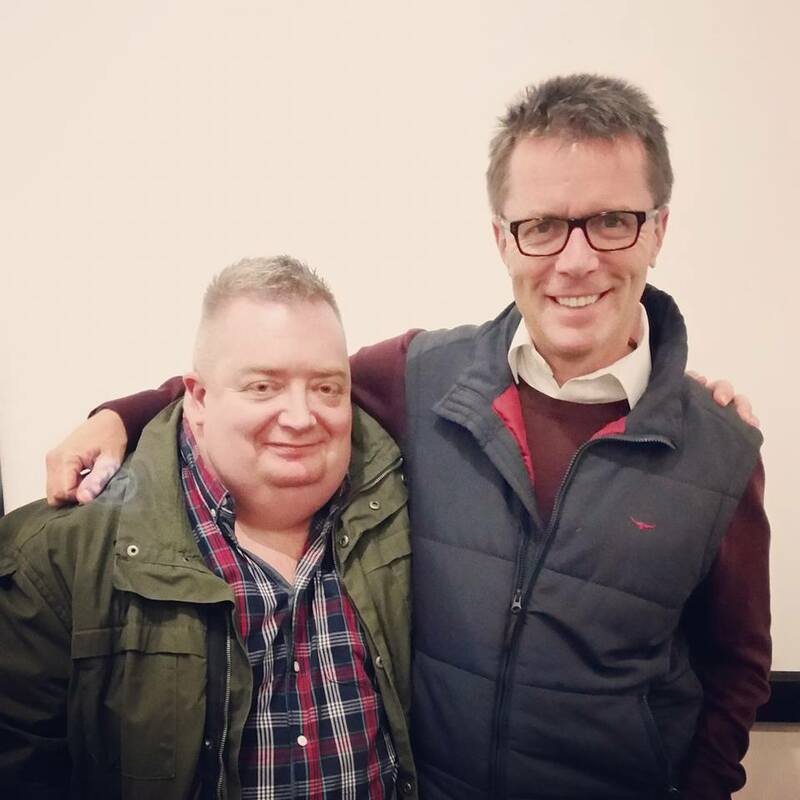 For someone who has a rare neurological condition, it is reassuring to know that the health services of the world still have figures like those revealed in the shape of the author, as he discusses how things went dealing with individual patients who crossed his path, ensuring he documents their lives with as much colour as is possible, without breaching any patient confidentiality. A beautiful read about a beautiful organ, and a beautiful man. Not an easy read, partly because of the density of the material, but partly because of the structure, but in my humble opinion, this book’s moment is now! It’s central focus – society’s apparent fetishisation of bureaucracy, and our collusion in that onward march, has never been more apt. 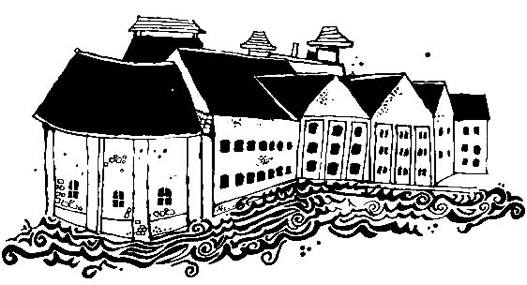 While there is no clear manifesto to lance us of the boil that is all to apparent from personal testimony with which we can all concur, the book uses this as a starting point for reflection which incorporates a range of threads – bureaucracy as a diversion, from right wing oppression, but also from our own fright at embracing un-trammelled play, while this ‘utopia of rules’ at least provides a structured game, where there is at least some transparency on what basis we can expect decisions to be taken. If you want to be left with a clear conclusion, this is not the book you are looking for. However, if you are looking for signposts that will help unearth where the piece of the jigsaw might be that might help reveal a clearer sense of the whole picture of the crazy state of the world today, I think this book is on to something! For a review elsewhere, see here.